Eviction scene: The descendants of the family in this photograph, taken in Glenbeigh, Co. Kerry in 1888, may have survived the Great Famine, but one wonders what became of them following their eviction and demolition of their home. From the Sean Sexton Collection. Thomas P. Duffy MD of the Yale School of Medicine explores why certain people survived the Great Hunger and reasons that the answer may lie in their gene pool. Shortly after the great Irish famine of 1847-49, the initial description appeared, in 1865, of a fatal disorder that compromised the liver and pancreas and resulted in bronzing or hyperpigmentation of the skin. Many explanations for the excessive iron burden were suggested, with alcohol ingestion, infection, and high iron intake being the leading culprits indicted over the next four decades. These etiologies were disproved in 1935 when the cause was correctly identified by J.H Sheldon, a British physician, as an inborn error of the metabolism of iron within the body. Diagnosis of the disorder, named hemochromatosis, initially required measuring the iron content of tissue specimens obtained by liver biopsy. When it became possible in 1960 to measure iron levels in the blood that mirror iron stores within the tissues, a simple means of screening patients for iron overload became available. A drawback in the measurement of serum iron levels was that it only identified patients in whom the disease was already advanced with its attendant damage to involved organs. Cirrhosis, diabetes, heart disease, arthritis and impotency represented the myriad presentations of the disorder, with liver cancer its most frequent fatal outcome. The full-blown disease occurred in men mainly in the fourth and fifth decades of life and in women in the fifth and sixth decades; the later onset in women was due to the iron loss that accompanies menstruation and child-bearing. In 1975, the discovery by French doctor and researcher Marcel Simon and his colleagues that family members who shared an HLA blood grouping with a hemochromatosis patient would also develop the disorder, allowed prevention of organ dysfunction by the simple method of blood-letting as a means of keeping the iron levels under control. The method of identifying candidates for hemochromatosis was greatly improved in 1996 with the identification by John N. Feder and colleagues of a specific gene mutation that results in malfunctioning of the mechanisms responsible for control of iron absorption within the body. The mutation, C282Y, results from a single amino-acid substitution of alanine for tyrosine on chromosome 6, with a loss of function of the normal gene. It is present in 85 percent of Caucasians with hemochromatosis and permits screening of populations and individuals who are at risk for developing the disease. The screening of populations for this HFE gene has documented a remarkably high incidence in the Celtic population, leading to the description of the HFE gene as the Celtic Gene. Among the Celts, HFE heterozygosity incidence is one in eight to ten individuals, and among the Irish Celts the incidence is as high as one in three to five. The new field of historic genomics has made an estimation of the age of the mutation responsible for the HFE gene possible. It appears to have originated in a Celtic or Viking ancestor some two to four thousand years ago and it has since spread via migration through the rest of Europe and Scandinavia. The switch from a meat and gatherer mode of living to a grains and cereal diet enabled by living off the land is a convincing basis for the initial appearance of the HFE gene. Its higher concentration among the Celts occupying Scotland, Wales, Ireland and Brittany is attributed to the Roman and/or Viking invasions of these regions. The relative isolation of island-based people may have impeded the diffusion of the gene that a larger canvas of Europe would have allowed. This would explain its prominence among the Celts in general but some additional factor(s) must have contributed to the highest frequency of the gene among the Irish Celts in Ireland, America and Australia. A screening study of newborns in a Dublin hospital identified heterozygosity for the gene in one-third of the babies. Another study of workers in the Polaroid Company in Boston found the gene mainly in Irish Celts. The question needs to be asked regarding the disproportionate frequency of the HFE gene among the Irish and if it provided a selective advantage during the Great Famine. Levels of an essential factor in iron delivery are reduced in malnourished individuals. A further contribution to a negative iron balance among the Irish was their heavy consumption of tea. Tea contains tannins that complex with iron in the gut and inhibit its absorption. Individuals possessing the gene for hemochromatosis would have been advantaged in the face of limited dietary iron availability and delivery. Those without the gene would have died in disproportionately large numbers since iron is one of the most critical elements within the body. 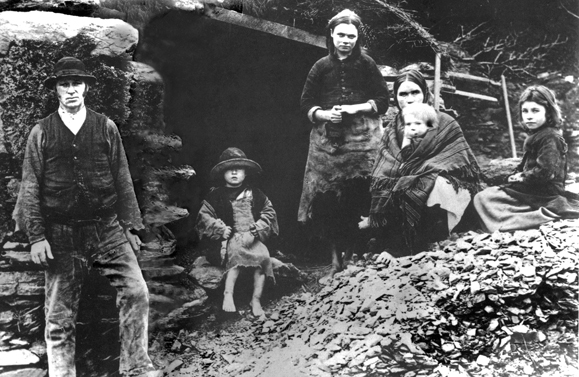 The Great Famine with its life-destroying absence of adequate nutrition magnified the importance of possession of the HFE gene for hemochromatosis. The mutation that can fatally exaggerate iron accumulation in the homozygote state may have made the critical difference of positive iron balance in the heterozygote during the famine. A concentration of individuals with the gene would occur among the survivors. Many of these survivors emigrated to America and Australia, transporting the strain of hemochromatosis to these countries. Ironically, the gene can now be used to document the wanderings throughout the world of the Irish people, many of whom carry in their genome the testimony to their ancestors’ iron advantage. Screening of the descendants of those Famine immigrants would identify the HFE gene and prevent organ dysfunction by early detection, and thus prevent tragedy from befalling later generations of the Celts. Xerophthalmia, an ulceration of the eye caused by Vitamin A deficiency, was increasingly recognized during the famine years. Scurvy also contributed to the death toll, with victims covered with bruises and bleeding lesions that are caused by Vitamin C deficiency; the potato famine deprived the Irish of a rich source of Vitamin C and a defense against the development of this bleeding disorder. Diarrheal disorders likely had infection as their cause, but a deficiency of niacin and riboflavin led to pellagra with its triad of diarrhea, dementia and dermatitis. prediction I was 83 on the 16th. I’m second generation from Ireland in the US. My grandfather came over age 5, in 1923. The first time I was asked about iron, was at age 24. I was at the hospital donating blood for someone, and I was asked “do you have a lot of energy? ” ” your iron is very high, enough for a large man.” Since then, my doctor has told me my iron is on the high side. I came across this mutation by chance on the Internet. I also read that the largest concentration of people with this mutation in the works is in County Mayo, Ireland, which is where my family came to the US from; Tourmekady, county Mayo to be exact. Hiya Roberta Robinson. My paternal grandmother came to the UK from Co. Mayo . Her Maiden name was Moyles. My grandfather was called John Murray. I need to some some ancestry digging really, as both are now deceased. My grandmother was a Catholic and I think my grandfather may have been Protestant because they ran away. I never knew my grandfather.They had 4 sons and a daughter, all born in the UK. My dad was the 3rd son in 1936 and is now 79. Interesting. I am eldest daughter and there is just my sister. I’m c282y X 2 homozygous. Sis is a carrier. No children. Just us 2 been tested in the family. It’s fascinating stuff. I wonder why the largest concentration in Mayo ? My mums family are from Mayo and she hasn’t the double mutation aswell as her brother and sister. They should do national screening for the gene there. Not just the blood test for the iron. My mums laid dormant until she stopped smoking. Smoking stops absorption of vitamin c, vitamin c is needed to absorb iron. Therefore she wasn’t absorbing any iron from her diet, so it did not show in her blood tests. Very interesting article. Thank you. The location of the photograph however needs editing. Glenbeigh is in Co. Kerry as opposed to Co. Cork. Many thanks. So far as I know, I escaped getting this mutation, although my mother’s people were from the border of Mayo and Roscommon. In fact, I’m somewhat anemic, although that is the result of fibroids I’ve had all my life. I’ve often wondered if I carry that gene. I recently found out I have Hereditary Hemochromatosis, my sister is a carrier but I think I have the full on disorder, I am wondering if each siblings might be different. My Grandma died before I was born, she had sclorosis and she came from Ireland. Good afternoon, our family is looking for our Irish heritage and wondered if there is a list of names who survived the famine. We would like to see if any names match ours to find our ancestors. Any help would be great. Thank you! The 1901 and 1911 censuses for Ireland are online and free to search. Google Ireland 1901 census . Remember that there are often various spellings for surnames. Does anyone have pernicious anemia or C282y. Or H63D gene on HFE gene? I was diagnosed with pernicious anemia when I was about 35. That was 20 yrs ago. I’m also dealing with multiple sclerosis. When I was diagnosed with the anemia, I was surprised it was the B12 type, because my mother was severely anemic, but of the iron deficient type. I haven’t had my DNA done – yet. I know the cause of my MS is metabolism related. But its due to toxic mold exposure, which has affected my metabolism.. The exposure has been since childhood and never diagnosed. I also suffered from severe malnutrition as a child, which probably made me vulnerable to infection and toxins. This article caught my attention b cause I’m wondering if I’m vulnerable to mold because of ancestors who managed to survive the famine. The fungus that caused the potato rot was from South America, and not found in other places in the world. MS seems to be common in the Irish as well. I know for a fact it’s what causes mine, not an inherited issue. My issues are similar. It is not well known, that high iron makes bioavailable copper low (see Morley Robbins). I am also a medical researcher, there is a lot of info suggesting perhaps ‘anemia’ is actually this copper deficiency. Iron fortification is insane (which is what the scientists initially said). Research also shows that B12 deficiency and copper deficiency ‘co-exist’. Copper deficiency looks like B12 deficiency which looks like MS! But you can’t just take copper alone (ie free). This was my problem. My ‘MS diagnosis’ went away when I increased my bioavailable copper. My high iron (hemochromatosis) also improved. My father was from Glasgow Scotland. His father had hemochromatosis and did not know it and died from it. My father had hemochromatosis and I was just diagnosed with it I have the double mutated Gene heterozygote. I just started phlebotomies in June.